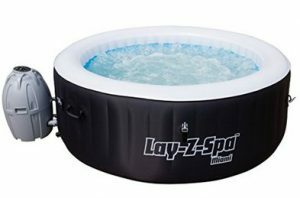 Review: Lay-Z-Spa Miami Hot Tub - Read This Before You Buy! In this article we’re reviewing the Miami hot tub from retailers ‘Lay Z Spa’. The first version was released in March 2013, with numerous upgrades since then. As you can see from our image on the left, this tub has a black PVC exterior with a thick white inlay and clips on the outside for the insulated lid to attach to. The brand name is also emblazoned across the front of the tub. While visually the tub isn’t the best we’ve seen, there are many redeeming features that we loved. Scroll down to read our full review, get a taste of the best features and study our expert’s best price comparison. Review Summary: As the smallest tub in the Lazy Spa range, this tub is perfect for those who have space restrictions and don’t need to fit 6 people in the spa at once. Given it has a super-low capacity of just 800 litres it’s also great for those looking to save money on their electricity bills. The tub was first released in November 2013 and we were worried that it might have dated somewhat, but the folks at Lay-Z-Spa have given the Miami a number of upgrades since then that have helped it keep pace with others in the range. In summary – if you’re a couple or a family with young children, this tub is the right choice for you. The Miami Lazy Spa was first released in late 2013 with a number of newer models released since then. That being said, this hot tub still holds its own and is one of the top selling spas of all time. It owes a lot of its success to its size. At just 1.8M x 0.65M and 800 litres it is the smallest Lay-Z-Spa in size, coverage and capacity. While not everyone will be looking for a small hot tub, this actually has a number of significant benefits. Most notably, the inflatable takes up a lot less room in the garden which is great for those with limitations in available space. The weight when filled of just 1,026kg makes it a great choice for those placing their tub on structures with weight restrictions such as garden decking. It’s also really easy to transport (provided it’s not filled of course). With just 800 litres of water to heat-up, the tub also reaches max temperature in less time than others in the range – with the added bonus of requiring less energy to keep warm. This of course means the added benefit of reducing your household energy consumption, and the size of your utility bills! This product has 81 pressure jets, which at first glance is less than others in the range. However, given it has less capacity, this is actually more jets per litre capacity than most other Lay-Z tubs. The result is an incredibly relaxing experience – and when heated near the max temperature of 40 degrees – total bliss! The limited size means that those looking to use their hot tub for large socials and parties should probably look at some bigger options. We would argue that the Miami spa is the perfect choice for couples with (or without) children. One area we feel slightly let down by is the appearance of this product once installed. It looks very plain with black and white PVC, while the huge logo on the outside looks a little unsightly. This is totally down to personal preference of course, but we can’t help but feel that other tubs in the range such as the Paris Spa (with its LED lighting) look a lot easier on the eye. With a smaller size than other spas, it’s great if you have limited space in your back garden. High number of air jets per litre capacity. Low energy consumption and less impact on your electricity bills. One of the cheapest hot tubs in the UK. The dual-action pump can heat water while simultaneously blowing massaging water through the pressure jets. The manufacturers claim it will fit 2-4 people – but 4 full-grown adults are a real squeeze! However, 2 adults and 2 children should fit comfortably. Very plain appearance and doesn’t have any LED lighting – though this can be bought separately. One of the perks of all Lazy Spa products is that they can be installed with incredible ease in just ten minutes. The installation kit includes a set-up DVD with a video also available online, with very simple guidelines for setting everything up. The starter kit also includes a pump for blowing up the inflatable. Obviously given that this is an inflatable tub, it’s incredibly easy to deflate and move if necessary. The Miami spa has a number of protective elements to prevent it from collapsing or deflating. The tub has 48 vertical beams and I-beam walls for added strength that help to prevent it warping out of shape. The PVC outer walls of the tub are also coated with rayon to help increase the resistance to punctures. This is a common issue with inflatable spas that has seemingly been eradicated by Lay Z Spa’s unique approach and makes it a great product for those worried about the fragility of inflatable hot tubs. The heating controls are incredibly simple to use, with the attached unit allowing users to pre-set when the spa should begin heating up. Given the water usually heats at 1 – 1.5 degrees per hour, this is an important feature that allows you to set the tub to reach perfect temperature for whenever you plan on using it. We’d advise setting the timer one day before for optimal performance. Note that the tub can’t be used in temperatures under 5 degrees, so this product is not suitable for the Winter months – unless you plan on setting it up indoors. The spa has a built-in water filtration system to ensure that the water you’re bathing in is clean at all times. Note that you will need to buy filter cartridges and testing equipment to keep the water clear of germs and dirt. Two filter cartridges are included with the starter kit. To help avoid dirt getting into the spa we’d also advise keeping a small pool of water next to the tub and asking users to wash their feet before getting in. Most of the dirt that finds its way into a hot tub will come from users treading in dirt before getting in. This should help to reduce the number of cartridges you need to buy on a regular basis.